Similar to charts and sparklines, conditional formatting provides another way to visualize data and make worksheets easier to understand. Formatting enables you to consequently apply arranging—such as colors, icons, and data bars—to at least one cells in light of the cell value. 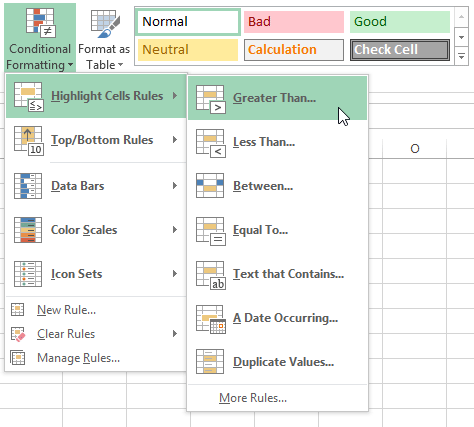 To do this, you’ll have to make a conditional formatting rule. For instance, a Conditional formatting guideline may be: If the esteem is under $2000, shading the cell red. By applying this administer, you’d have the capacity to rapidly observe which cells contain values under $2000. In our case, we have a worksheet containing deals information, and we’d get a kick out of the chance to see which business people are meeting their month to month deals objectives. The business objective is $4000 every month, so we’ll make a restrictive designing guideline for any cells containing an esteem higher than 4000. Select the desired cells for the Formatting rule. From the Home tab, click the Formatting command. A drop-down menu will appear. Then select the desired rule from the menu that appears. In our example, we want to highlight cells that are greater than $4000. The formatting will be applied to the selected cells. In our example, it’s easy to see which salespeople reached the $4000 sales goal for each month. You can apply multiple formatting rules to a cell range or worksheet, allowing you to visualize different trends and patterns in your data. Click the Formatting command. A drop-down menu will appear. Hover the mouse over Clear Rules, and choose which rules you want to clear. 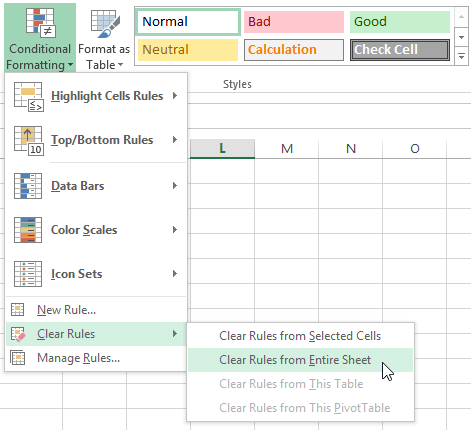 In our example, we’ll select Clear Rules from Entire Sheet to remove all conditional formatting from the worksheet.